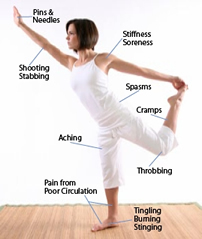 Do you suffer from shooting, stabbing or tingling pain in your arms, hands, feet or legs? Do you suffer from Diabetes, PVD, or another condition that is causing poor circulation? Have you recently undergone a course of Chemotherapy? Do you have a painful injury that just won’t go away? Does muscle spasm or muscle stiffness keep you from participating in activites you love? If you can answer YES to any of the images above – you are likely an excellent candidate for treatment with either Professional or Consumer Anodyne® Therapy Systems. Anodyne® Infrared Therapy Systems are medical devices that are indicated to increase circulation and reduce pain, stiffness, and muscle spasm – and are manufactured in Tampa, Florida by Anodyne Therapy LLC. Anodyne® Therapy Systems are infrared light therapy devices, that for the past 15 years, have been the choice of over 1/2 a million peoplelooking for a non-invasive, drug free way to live with less pain , stiffness or muscle spasm; or increase their local circulation. Anodyne® Infrared Therapy Systems are used in a clinical setting by numerous health care professionals such as, Therapists, Nurses, MD’s, DO’s, Podiatrists, Chiropractors, and Nurses for improved patient outcomes.